It is pleasing to one who is interested in genuine reform to read your editorial page in the present crisis. 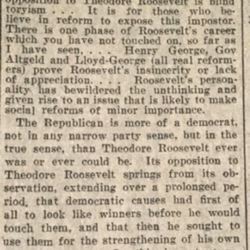 Much of the opposition to Theodore Roosevelt is blind toryism...It is for those who believe in reform to expose this impostor. 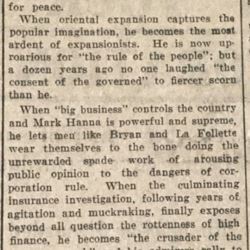 There is one phase of Roosevelt's career which you have not touched on, so far as I have seen,...Henry George, Gov Altgeld and Lloyd-George (all real reformers) prove Roosevelt's insincerity or lack of appreciation...Roosevelt's personality has bewildered the unthinking and given rise to an issue that is likely to make social reforms of minor importance. 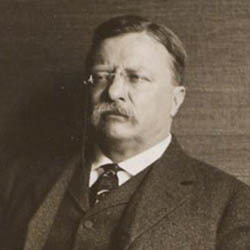 The Republican is more of a democrat, not in any narrow party sense, but in the true sense, than Theodore Roosevelt ever was or ever could be. 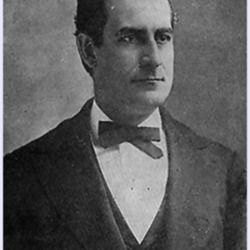 Its opposition to Theodore Roosevelt springs from its observation, extending over a prolonged period that democratic causes had first of all to look like winners before he would touch them, and that then he ought to use them for the strengthening of his own arbitrary power. In this important respect he is ominously like that familiar yet sinister figure in history -- the [demagogue] who succeeds in rearing a despotism on the ruins of democratic government. When there is a war spirit in the land [page2], he souses himself in it and loves to brandish the dripping sword. When peace is obviously the thing and the only thing, if there is any glory in it for himself especially, he becomes furious for peace. When oriental expansion captures the popular imagination, he becomes the most ardent of expansionists. 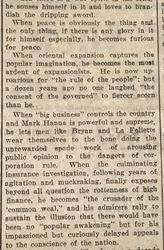 He is now uproarious for "the rule of the people"; but a dozen years ago no one laughed "the consent of the governed" to fiercer scorn than he. 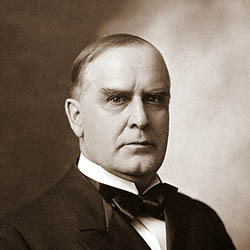 He becomes a tariff reformer a decade after even McKinley had declared, in his last public utterance, that the period of exclusiveness was past. Yet, after indorsing complete free trade with Canada, when reciprocity seemed likely to be established, be flipflaps like an acrobat and denounces free trade for the sake of votes. He [endorses] the direct election of United States senators after the long fight for it had triumphed, and 12 years after Bryan had put it into a democratic platform, and then claims that he alone can be trusted to establish and maintain "the peoples rule." 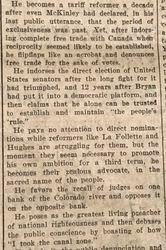 He pays no attention to direct nominations while reformers like La Follette and Hughes are struggling for them, but the moment they seem necessary to promote his own ambition for a third term, he becomes their zealous advocate, in the sacred name of the people. 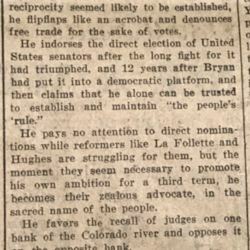 He favors the recall of judges on one bank of the Colorado river and opposes it on the opposite bank. 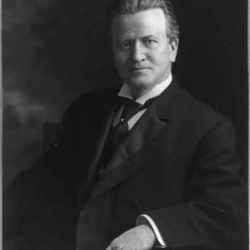 He leads in the public denunciation and in the prosecution of the Standard oil company, and, at the same time, secretly accepts and [endorses] an underling's judgement that the antitrust law is "an economic absurdity" which should not be enforced against the steel and harvester trusts, especially since a prosecution of them would arouse the enmity of "the powerful Morgan interests." 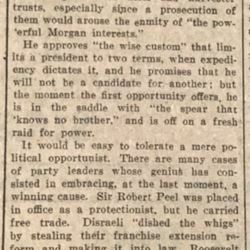 He approves "the wise custom" that limits a president to two terms, when expediency dictates it, and he promises that he will not be a candidate for another; but the moment the first opportunity offers, he is in the saddle with "the spear that "knowns no brother," and is off on a fresh raid, for power. 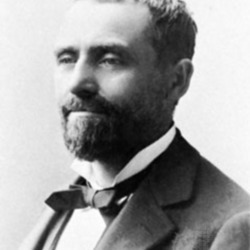 But Roosevelt is all that the shifty opportunist is; he is much more. And it is what is more that makes him so dangerous. Even to his admirers the danger spot comes out. They see it. He has a passionate love of power and dictatorial, ungovernable spirit in the exercise of power. He fiercely chafes against the constitutional restraints which a democracy must impose upon its rulers. The incontestable proof of this runs through the record of his two administrations, in case after case which could be cited. 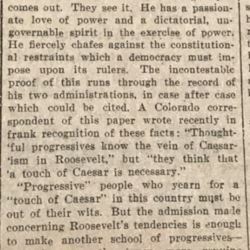 A Colorado correspondent of this paper wrote recently in frank recognition of these facts: "Thoughtful progressives know the vein of Caesarism in Roosevelt," but "they think that a touch of Caesar is necessary." 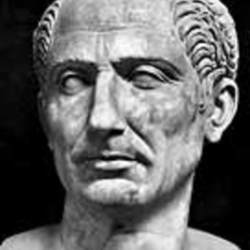 "Progressive" people who yearn for a "touch of Caesar" in this country must be out of their wits. 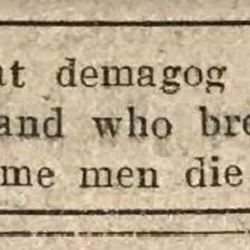 But the admission made concerning Roosevelt's tendencies is enough to make another school of progressives -- and they are the truer, more genuine democrats, by far -- irreconcilable opponents of a popular leader who combines the qualities [page 6] of a great [demagogue] with the traits of a dictator, and who breaks his pledges as coolly as some men die for them. 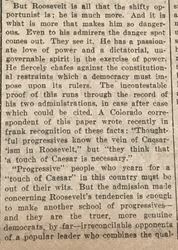 The author eviscerates Roosevelt for seeking a third term as President of the United States and chastises the Progressive Party for supporting him. 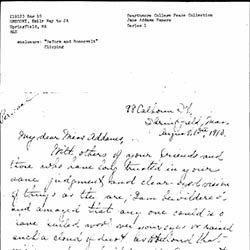 A poor microfilm image was replaced with a scan from original at the Newberry Library. 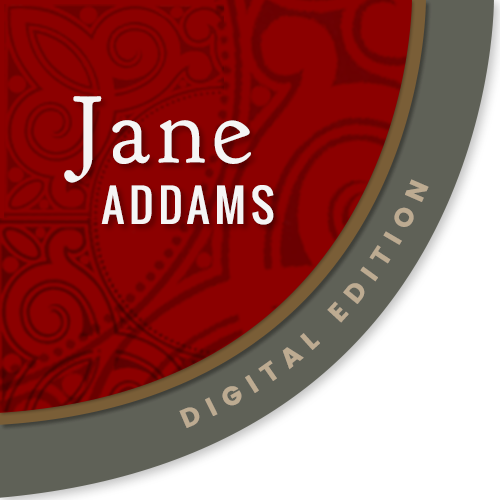 The Springfield Daily Republican, “Reform and Roosevelt, May 24, 1912,” Jane Addams Digital Edition, accessed April 22, 2019, https://digital.janeaddams.ramapo.edu/items/show/5615.